A spring visit gives visitors an early glimpse into the city’s beautiful parks and gardens as the first primroses bloom and crocuses appear. Dining and shopping are the main activities in town; although if it’s a beautiful warm day, the nearby beaches and nature preserves are tempting to visitors as well. Evening entertainment is provided by The Music Hall and local theaters in the form of regular shows and films.During the summer and fall, Portsmouth is buzzing with activity. Visit outdoor attractions, tour museums & historic homes, attend festivals, and explore the beaches. Shops and restaurants keep later hours in the warmer months, and people stroll leisurely through Market Square all day and into the evening. One of the most common sights…couples strolling with ice cream cones in hand from Annabelle’s. Winter in Portsmouth is time to slow down, and enjoy the local shops and restaurants. For some holiday shopping, head to Kittery Outlets in Southern Maine. If there’s a nice snowfall, take a winter wonderland snowshoe trip through one of the nature preserves, or go see the beach in a whole new way. During the winter months, people are drawn from nearby cities to Portsmouth by local theaters, live music venues, and special events (such as cooking classes at Stonewall Kitchen). Portsmouth’s Restaurant Week takes place twice a year in the spring and in the fall and gives both visitors and locals a chance to experience the special flavors of the city with limited-time promotions at participating restaurants. 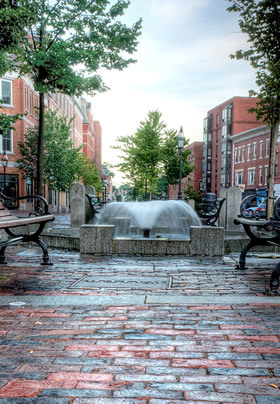 Downtown Portsmouth is located just a 10-minute walk from Martin Hill Inn and within a 30-minute drive or less you can experience the many activities listed below. For more information on other attractions in and around Portsmouth, you can also visit Portsmouthnh.com or HiddenVacations.com. Art ‘Round Town features simultaneous art gallery openings the second Friday of each month from 5 to 8 pm. Visit www.artroundtown.org. At The Music Hall – Every other week take a Historic Tour of the inner workings of the Hall. Poetry: The Poetry Hoot the first Wednesday of every month at Cafe Espresso at 738 Islington Street. Call 603-772-4345. Stone Pigeon Poetry Readings from 7 to 9 pm the second Monday of every month, two feature readers followed by an open mike at Breaking New Grounds. Be a painter for an evening, no experience needed. Art with a Splash offers an opportunity to combine the artistic with a touch of wine. Check the PortsmouthNH.com events calendar for the latest listing of happenings in the Portsmouth area. Strawbery Banke Museum – More than 20 buildings and 300 years of Portsmouth, New England and American history. Opens May 1st. Wentworth Lear Historic Houses– Two houses for the price of one: An Historic Landmark building and excellent example of Georgian architecture along with the family home of President George Washington’s private secretary. Opens mid-June for tours Wednesday to Sunday. Governor Langdon House, Rundlet May House, Jackson House – These very different properties belong to Historic New England providing varied glimpses into our past from the grandeur of a governor’s home to the everyday living of one of the oldest frame homes in the area. Openings vary, generally mid-June. Warner House – See some wonderful examples of Portsmouth furniture making at its finest. Opens mid-June. Moffatt Ladd House – If walls could talk, this house could say a lot. William Whipple, signer of the Declaration of Independence, lived here. Opens early June. Wentworth-Coolidge Mansion – A rambling waterfront mansion with stunning grounds and lilac bushes blooming each May. Opens weekends in mid-May and Wednesday to Sunday starting mid-June. Gundalow Piscataqua – Learn the history of our mighty river and the life of a seaport during your sail on the Piscataqua. Read about our ride on the Gundalow. 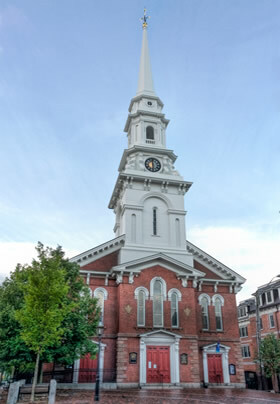 Seacoast New Hampshire Heritage Tours – Learn everything about the 350+ years of NH seacoast history on this guided 2 or 3 hour tour by mini-van. Small groups, under 6 people. Tour covers downtown Portsmouth and New Castle. Canterbury Shaker Village – Drive less than an hour toward Concord, NH to visit this serenely beautiful village of Shaker Buildings. Tour the facilities, see how the Shakers lived, worked and practiced their faith. Open mid-May to late October. Martin Hill Inn participates in the Village’s lodging partnership program and can provide guests with discount coupons; just ask the Innkeeper. The Music Hall – Visit the website or Call for information. Black Trumpet Bistro: One of our favorites serving locally sourced meats and vegetables, unique combinations of flavors, foods and ethnic influences. The upstairs wine bar offers a lovely view of the river and tugboats. Jumpin’ Jay’s Fish Cafe: Everyone’s favorite seafood restaurant patronized by locals and tourists alike. Jays serves the best-steamed mussel appetizer we’ve ever tasted. The fresh catch of the day board usually has at least eight types of fish to choose from, sourced locally when possible. During oyster season, enjoy the Tuesday “Shuck-a-Buck” event. For lobster, visit Robert’s Maine Grill, in next-door Kittery Maine. Located along Spruce Creek, Robert’s serves classic New England fare from Yankee pot roast to clam chowder to chili and (of course) steamed lobster. You can even order a tableside clambake for two with all the fixings. Try this year’s favorite among our guests – Cure -www.curerestaurantportsmouth.com/ located in Down Town Portsmouth. Visit the beaches of the New Hampshire seacoast located in Rye, New Castle, and Hampton. Challenge yourself on memorable and picturesque golf courses, such as the Portsmouth Golf Club, Breakfast Hill, and the Ledges. Take a hike, boat, or bike trip at Odiorne Point State Park. Go fishing or whale watching from Rye Harbor State Park. See Portsmouth Harbor on the The MV Heritage. Or cruise out to view the Isles of Shoals on The MV Thomas Leighton. Take a tour of a local brewery, available at Red Hook Brewery, daily, or Smuttynose Brewery, by appointment. Try your hand at knitting, quilting or other sewing projects. See the class schedule at the Portsmouth Fabric Company and the Yarn Sellar in York, ME. Sign up for a wide variety of cooking classes at Attrezzi or at Stonewall Kitchen in York for a stimulating evening of food and wine. “Thank you so much for the amazing breakfasts and for always being ready with a suggestion for dinner or directions. We had a wonderful time and would love to return in the near future.” Dan & Alix, New York.